Cysts are a ball of dead skin cells that are contained in a sack lined with normal skin. The skin cells lining the cyst make skin cells that sloughed off and are trapped in the center of the cyst sack. As time goes by, more and more skin cells are trapped in the cyst causing the cyst to grow larger. Cysts do not go away on their own, even though they may get bigger or smaller. Cysts often develop due to an ingrown hair or acne lesion but may also begin spontaneously from oil and skin build-up at a pore or hair follicle. Pilar cysts appear on your scalp. Rather often, most people notice knots under their hair. Once you find them, get them removed. When left alone, they’ll cause hair loss on that part of the scalp, or they may even rupture, which is a painful and messy experience. Made famous in pimple-popping videos, these cysts return repeatedly after you squeeze them. Sebaceous cysts form when skin turns inward, and creates a pocket or sack. Think of it like a balloon – after the pocket forms, it fills with dead skin cells that are trying to escape. The body keeps pushing the cells to the outer layer of the skin, but they’re stuck in the little pocket. Like a balloon, it will eventually burst – either from squeezing or overfilling. If the cyst bursts under the skin, the area becomes red and inflamed. However, it’s not an infection. It’s the body’s reaction to fighting the cyst and expelling the cells that don’t belong there. Do dermatologists remove sebaceous cysts differently than you would at home? Most definitely. You have to remove the entire pocket to prevent it from refilling. So we make an incision, take the whole sack out, and stitch it up to prevent scarring. Rather than trying to pop the cyst or remove the sack on your own, have a dermatologist perform a sebaceous cyst removal. If any part of the sack is left, the cyst will likely return. Caused by joint fluid, digital mucous cysts form little bubbles on the joints of fingers or toes. Usually, they appear on the joint closest to the nail as a clear, hard bubble (like a blister). 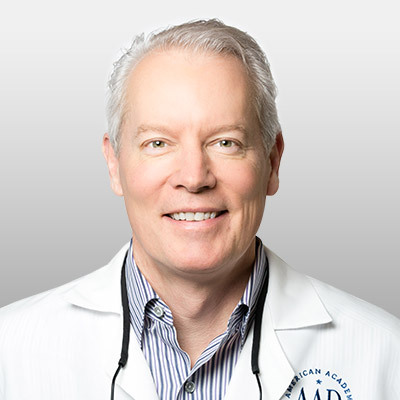 Of all types of cysts, the digital mucous cyst is the most difficult to remove. We numb the finger, shave off the top of the blister, and drain the sticky fluid inside. It usually takes several procedures to see improvement, as these cysts are very resistant to treatment. How Much Does It Cost to Remove a Cyst? Health costs fluctuate depending on your insurance. Insurance companies determine the amount the doctor should be paid for each procedure. So if that doctor accepts your insurance, then they have agreed to accept a certain amount for each insurance code. To find out your specific cost for a dermatologist cyst removal, ask your doctor for the insurance code for your procedure. The code depends on the size of the cyst and its position on the body. For example, a three-centimeter cyst on the back has a different code than a three-millimeter cyst on the trunk. Then there will be a separate code for repair (the stitches). Add both amounts to figure out your total cost. Also, make sure you know your deductible (and how much you’ve already paid). If you haven’t met your deductible, the cost of the procedure comes out of your pocket. The amount you pay is then credited towards meeting your yearly deductible. A cyst will never go away on its own. If left untreated, it will continue to grow until it eventually ruptures. Then, in time, it will return. Why Does A Cyst Require Treatment? Ideally, a cyst should be treated before it ruptures. When a cyst ruptures, the skin cells in the balloon disperse and break up in the area under the skin. This causes a lot of pain and inflammation that tends to last a long time because the body has to break down and carry away skin cells that don’t belong under the skin. Because the cyst has been emptied, it’s capable of recovering and starting again. The cyst can repeatedly rupture and fill up. This cycle is not only painful, but it also creates scarring in the area. Chronically ruptured cysts are complicated and difficult to treat because the area turns into a mix of scar tissue and a number of small cysts that have broken off and formed. At that point, it’s usually best to surgically remove the entire area of skin. On the other hand, if the cyst isn’t ruptured, it’s relatively easy to remove the entire cyst, which allows the wound to heal quickly so you can avoid the problems of chronically ruptured cysts. When Does a Cyst Need Treatment? A cyst feels like a little knot or kernel underneath the skin. It may begin as an ingrown hair or acne pore that becomes infected, creating an opportunity for the skin to get turned in on itself. The cyst may also drain a bit. A Pilar cyst grows on the scalp and tends to be hereditary, while epidermoid cysts occur on other parts of the body and will not go away on their own. If a cyst becomes infected, it can limit the treatment options to draining and antibiotics. The sooner you see a dermatologist after noticing a cyst, the smaller the chance of pain developing or the cyst coming back. If you’re not sure if you have a cyst, see a dermatologist and let an expert make the diagnosis. 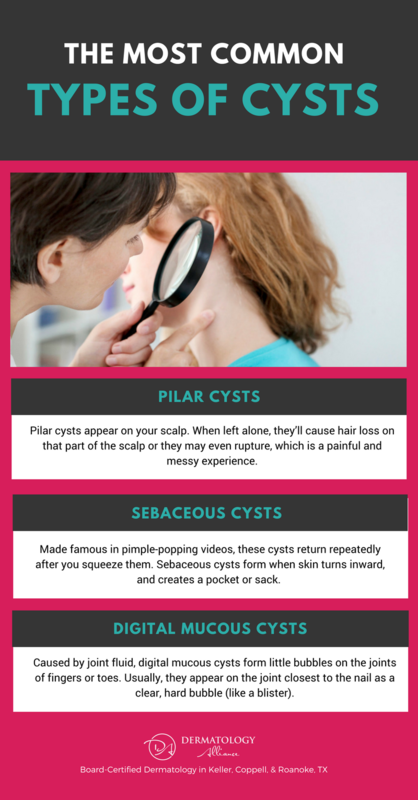 Contact us today for more information about cysts. Skin Cysts: When Is It Time to See A Dermatologist?